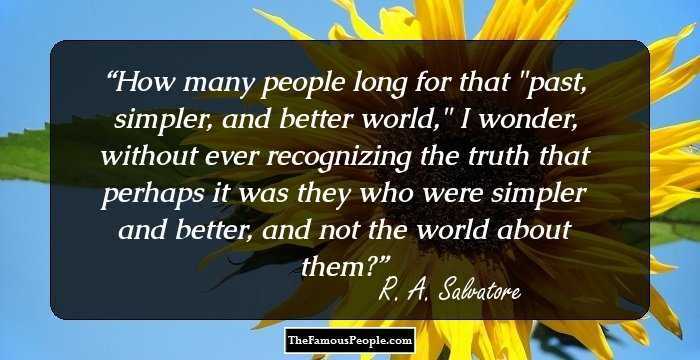 A collection of R. A. Salvatore Quotes about joy, friendship, life, mystery, truth, fear, struggle, quitting, change, growth, luck and much more. 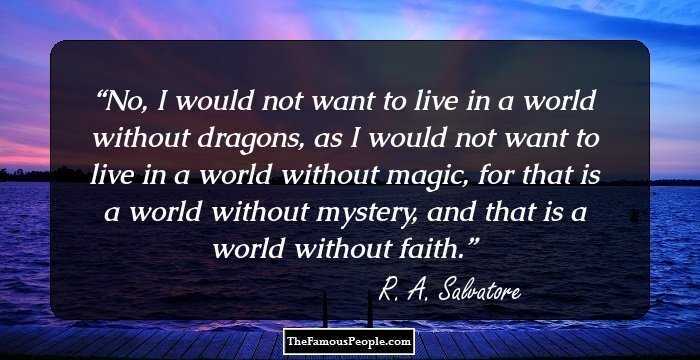 Robert Anthony Salvatore is one of the most successful authors of the fantasy genre, who enjoys a large and loyal fan following. 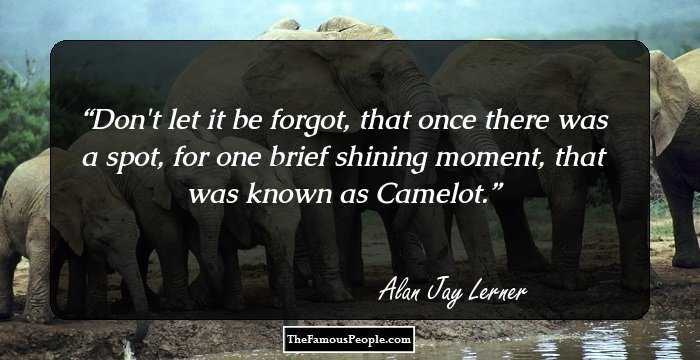 The American author is best known for his versatile works-- 'Forgotten Realms', 'The DemonWars Saga’ and 'Vector Prime' that pioneered the great Star Wars series. More than 15 million copies of his novel were sold in the United States and the book was finally adapted as the movie. Around 22 of his books have been listed on New York Times Best Seller list. Some of his works sold over 10,000,000 copies worldwide. Salvatore's love for fantasy began during his sophomore year of college. He was a major in computer science, but later switched to journalism. After attaining a Bachelor's degree in communications and English, he took up writing in 1982. Meanwhile, he did several jobs until he began a full-time career in writing in 1990's. He worked on about 22 book series and wrote about two dozen short stories. Apart from writing novels, Salvator also wrote snippets for comics and video games. Some of his most incredible works were adapted in game stories for Xbox, PS2 and the PC video game-- 'Forgotten Realms: Demon Stone'. Salvatore's works were translated into 15 different languages and inspired several video game addicts and comics fans around the world. 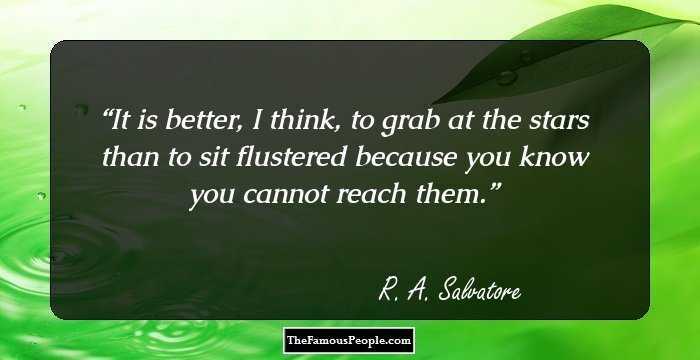 We have collected Robert Anthony Salvatore’s quotes from his noted books and writings. 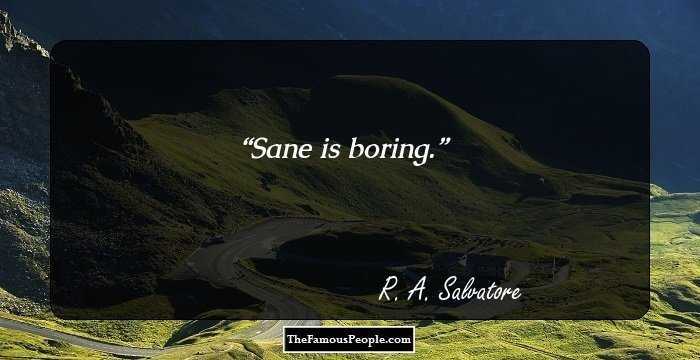 Here is a collection of Robert Anthony Salvatore quotes about joy, friendship, life, mystery, truth, fear, struggle, quitting, change, growth, luck and much more. Everyone dies. 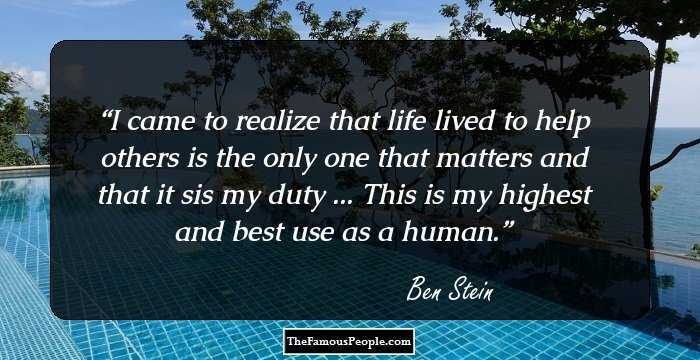 It is how one lives that matters. If you can quit, then quit. If you can't quit, you're a writer. Luck?" Drizzt replied. "Perhaps. But more often, I dare to say, luck is simply the advantage a true warrior gains in excuting the correct course of action. We need to be reminded sometimes that a sunrise last but a few minutes. But its beauty can burn in our hearts eternally. I don't have to prove my worth and value to any but those I love, and that I do by being who I am, with confidence that those I love appreciate the good and accept the bad. Does anything else really matter? There is a wide world out there, full of pain, but filled with joy as well. 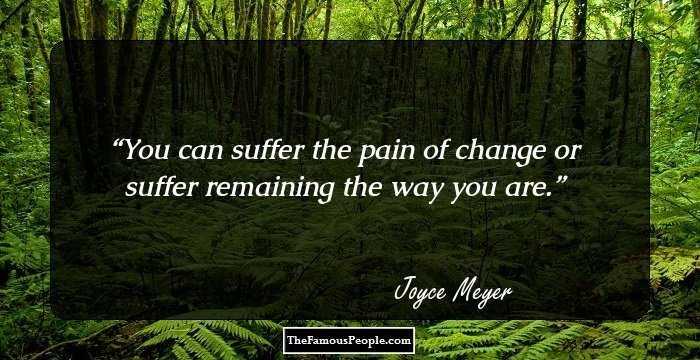 The former keeps you on the path of growth and the latter makes the journey tolerable. Artemis Entreri: Do not underestimate Jarlaxle. Many have; they all are dead. It is more difficult by far to be independent of our own inner shackles than it is of the shackles that others might place upon us. The gods of the realms are many and varied -- or they are the many and varied names and identities tagged onto the same being. I know not -- and care not -- which. ...a third [of three] had died in his bunk of natural causes--for a dagger in the heart quite naturally ends one's life. I will always love you Drizzt Do'Urden my life was full and without regret because I knew you and was completed by you. Sleep well, my love. Take your love and your pleasure as you find it. Do not worry so much of the future that you let today pass you by. you are happy. need you know more than that? Farewell, my friend," Drizzt whispered, trying futilely to keep his voice from breaking. :This journey you make alone. I've spared with demons from the Nine Hells themselves, I shall barely break a sweat here today. Drizzt had always suspected it, but now it was confirmed, that "welcome" was his favortie word in the Common Tongue, and a word, he understood with no equivalent in the language of the drow. Every day is a chance to start over. Any day can be bad, surely, but any day can be good, can be great, and that promise, that potential, is a beautiful thing indeed. Nostalgia is possibly the greatest of the lies that we all tell ourselves. It is the glossing of the past to fit the sensibilities of the present. To learn how to use a sword, one must first master when to use a sword. Why do ye care," elf? Athrogate asked him. "I do not know," came Jarlaxle's honest response. Nothing burns in your heart like the emptiness of losing something, someone, before you truly have learned of its value. To Han Solo, the galaxy seemed a more dangerous place by far. Beware the engineers of society, I say, who would make everyone in all the world equal. Opportunity should be equal, must be equal, but achievement must remain individual. 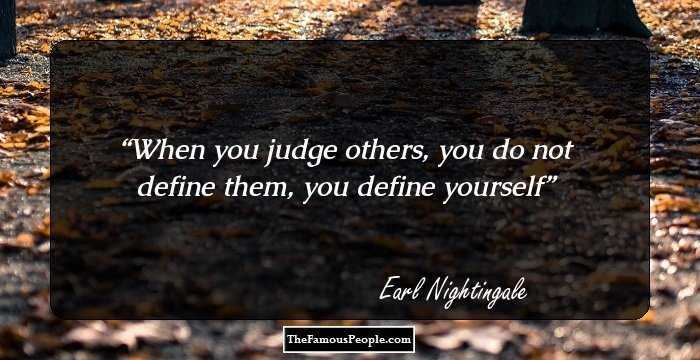 We - at least we of sincere character - always judge ourselves by stricter standards than we expect others to abide by. To lose is to die! You may win a thousand fights, but you can only lose one! It is a defeat of the spirit to learn one's arrogance causes such loss and pain. Pride invites you to soar to heights and the footing, tentative. farther, then, is the fall. What is it about your race that none of you can seem to properly weigh your own value? 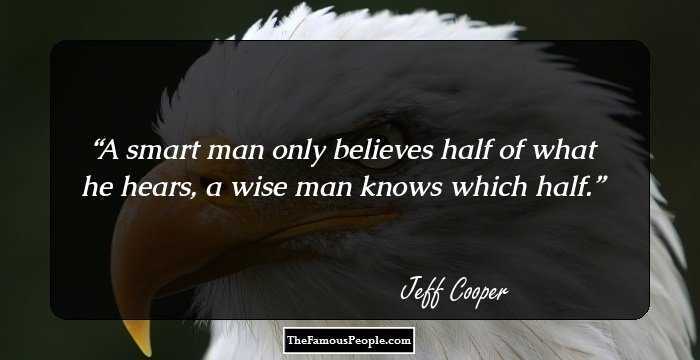 Every human seems to think more of herself than she should, or less of herself than is sensible! Make yer laughs where ye can, little one, because yer tears’ll chase ye and catch ye where they will. The character of the person would outweigh the color of his skin and the reputation of his heritage. 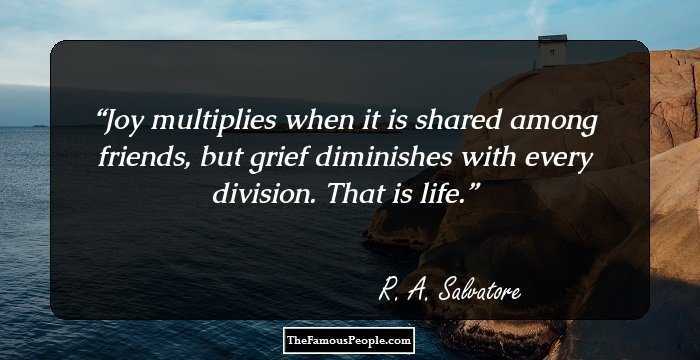 Joy multiples when it is shared among friends, but grief diminishes with every division. That is life. Only when we admit to our failures and recognize our weaknesses can we rise above them. Only with the honest knowledge that one day I will die can I ever truly begin to live. Sometimes the most difficult battles are the ones we are forced not to fight. This is my fear, of a life wasted, of a cause misbegotten, of a belief that is, in the end, an empty and unattainable ideal, the foolish designs of an innocent child who believed there could be more. Here have been many times in my life when I have felt helpless. It is perhaps the most acute pain a person can know, founded in frustration and ventless rage. Sensual pleasures are, or should be, the culmination of physical desires combined with an intellectual and emotional decision, a giving of oneself, body and spirit, in a bond of trust and respect. All of his life had been filled with crashing ends to promising beginnings. In the heart, there is no sting greater than watching the struggles of one you love, knowing that only through such strife will that person grow and recognize the potential of his or her existence. If we have fallen so far as to need an avatar, an undeniable manifestation of a god, to show us our way, then we are pitiful creatures indeed. I don’t like the sand. It’s coarse and rough and irritating. And it gets everywhere. Because of the friends I have known, the honorable people I have met, I know I am no solitary hero of unique causes. 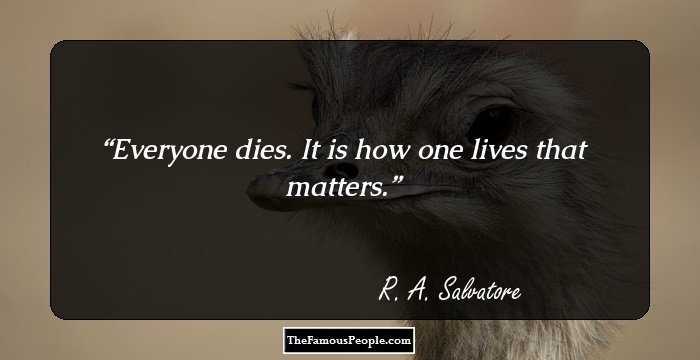 I know that when I die, that which is important will live on. Is that not the whole point of gaining experience, to use it to make wiser choices, to temper destructive instincts, to find better resolutions? How ironic it is that our instincts often run exactly opposite from what we truly desire for those we love. That is the honest nature of friendship. 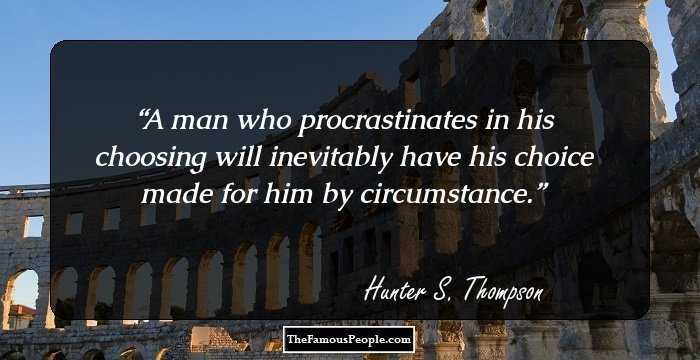 That is when it becomes sincere, and not self-serving. I consider every person an enemy until he has proven himself differently, and I find that in knowing my enemies, I can prepare against anything they might send against me. This is the way of the world, but is is not the only way. Where in the nine hells did you ever find the notion that I would fight fair? 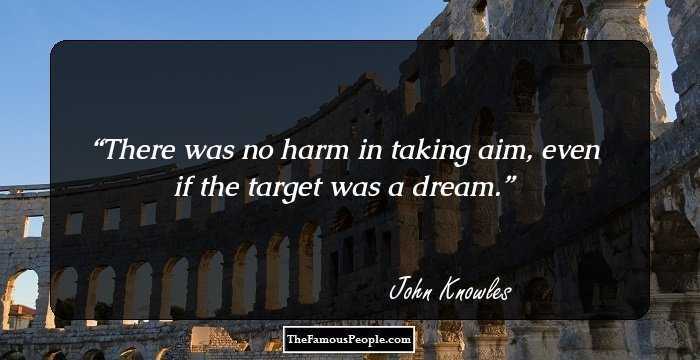 We seek goals as if their achievement will grant magical happiness and unending fulfillment, but is that ever the case? 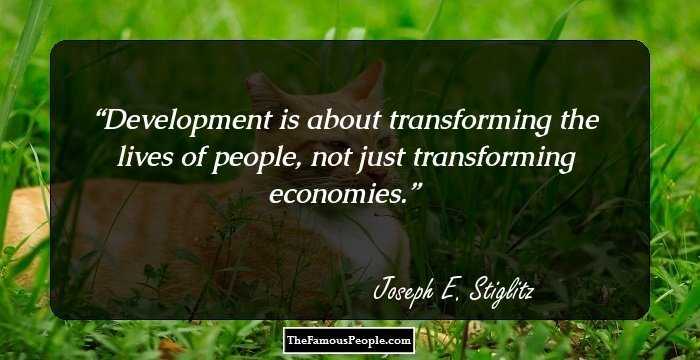 Are we then creatures of action? Do we say that we desire those accepted cliches of comfort when, in fact, it is the challenge and the adventure that truly give us life? In the dim light of Twinkle’s glow, their skin colors lost in a common gray, they seemed alike, brethren come from the same mold. Entreri approved of that perception, but Drizzt surely did not. Because when we reach, when we seek that place we have only seen in our imagination, we threaten the order of things, and threaten most especially the place of those who have found a better roost. Fie these gods! What beings are these who would play so cruelly with the sensibilities of rational, conscientious mortals? Those who aspire to less accomplish less. There can be no doubt. It is better, I think, to grab at the stars than to sit flustered because you know you cannot reach them. The world is a dark place,” Kipper replied. “But when friends join hands, it lightens. For whatever we do in our lives, discipline and control over our own actions ultimately measure the level of our success. The world is not static, and if the roots of our perceptions, traditions, hold static, then we are doomed, I say, into destructive dogma. When I die … may there be friends who will grieve for me, who will carry our shared joys and pains, who will carry my memory. Pride invites you to soar to heights of personal triumph, but the wind is stronger at those heights and the footing, tentative. Farther, then, is the fall. I don’t desire glory. Glory brings fame, and fame brings jealousy, and jealousy brings danger. When all is a facade, wound within webs of deception, the truth is what you make of it. It is difficult to realize that you cannot win every battle for every friend. ...and the third died in his bunk of natural causes — for a dagger in the heart quite naturally ends one's life. Without satisfaction, he will find no contentment, and without contentment, he will find no joy. When you live with death so close, you come to appreciate life all the more. I will never forget that you came for me, Drizzt Do’Urden,” Entreri called after him, and for some reason he didn’t quite yet understand, those words filled Drizzt’s heart. Magic is neither good nor evil. It merely is.